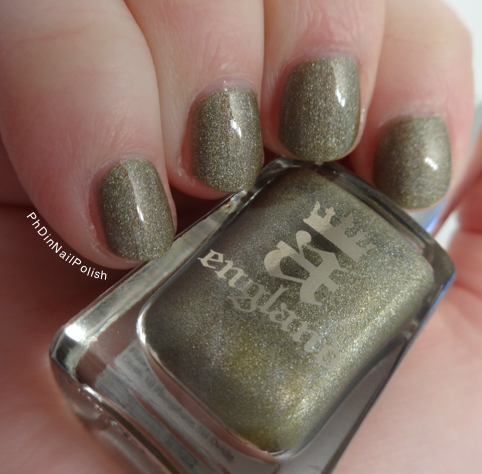 Confession: generally, I want ALL the A Englands, especially the holos. 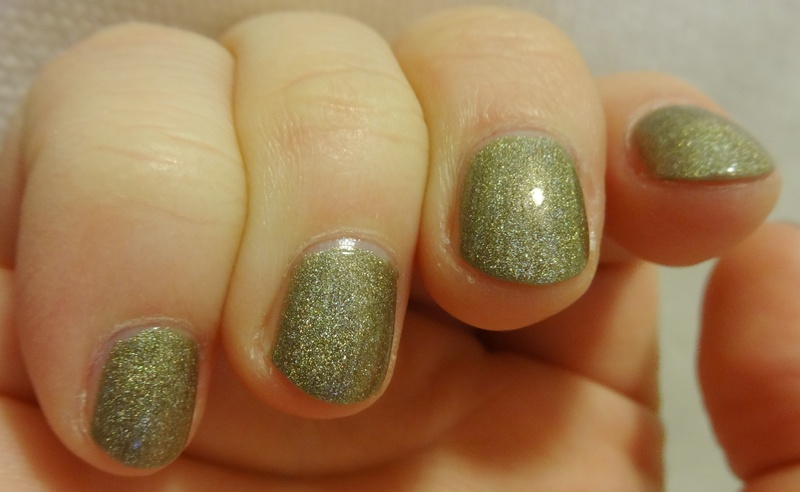 So, when I went on a search for a gold-ish holo for the times when my nails need something not brightly colored, I immediately snatched up Princess Sabra (Tristam Eyes) from the Legends Collection. It is a lovely light brownish-beige color that is probably appropriate for all occasions. Unfortunately for me, I just can’t seem to get the holo to come out (sad face). Maybe I should retire this polish until the summer, when it is sunny all the time, but for the winter, this is more of a semi-sparkly neutral (the sparkle is the same dimensional effect as a textured polish with topcoat, to give you an idea). Now, my disappointment with its holo-ness aside, the formula on this is great. I did two thin coats here, but if you have longer nails, you might want to go with three thin coats. The wear time is great- I wore if for about a week while vacationing and was very hard on my nails, and it suffered only a single minor chip (from suitcase wrangling). It dries fast, and a little bit satin, so you’ll want a topcoat to make it shiny. I’ve used Glisten and Glow HK Girl.